For my upcoming bicycle tour across Europe and Africa, I needed to find a bike that was not only comfortable, strong, and capable of handling the demands of long-distance touring, but I also needed a bike that could be ridden in both on and off-road conditions. 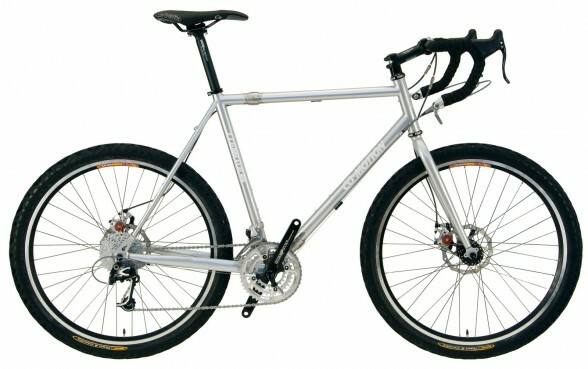 Because I will be spending about six months of my upcoming bike tour cycling on paved streets and bicycle paths in mainland Europe, and another six months or more pedaling down dirt and gravel roads in both Iceland and Africa, it was imperative that I find a bicycle that could handle the demands of both on and off-road travel. That’s when I began looking at the Co-Motion Pangea, a high-end touring bicycle made by Co-Motion Cycles, a small bicycle manufacturer located in Eugene, Oregon (USA). When I started planning my upcoming bike ride across Europe and Africa, I began to realize that none of the touring bikes in my current stable of bicycles would be capable of handling the off-road riding that I was planning for my upcoming trip. The more I thought about it, the more I realized that the Co-Motion Pangea, my tradeshow dream bike, had all the qualities I was looking for in my next touring bicycle. Co-Motion goes out of their way to provide you with the best fitting bicycle they possibly can. Before you order a bike from the company, your measurements are taken and based on these measurements, it is determined whether one of the standard size Co-Motion frames will work for you, or if you need something a little different. Based on my measurements (I’m very tall and very skinny), it was determined that I would need a large 62 cm frame. Like most good touring bicycles, the Co-Motion Pangea is built on a strong, yet comfortable steel frame. Like I mention inside The Essential Guide To Touring Bicycles, steel is the ideal metal for use in a touring bicycle because it provides you with the strength and stability you need to carry heavy loads, while at the same time giving you the flexibility needed for sitting in the saddle for long periods of time. If it weren’t for the dropped handlebars on the Pangea, you might just think that this bicycle were made entirely for the mountains. But the drop handlebars on the Pangea are there to provide you with the multiple hand positions you need when touring for days, weeks, and months on end. 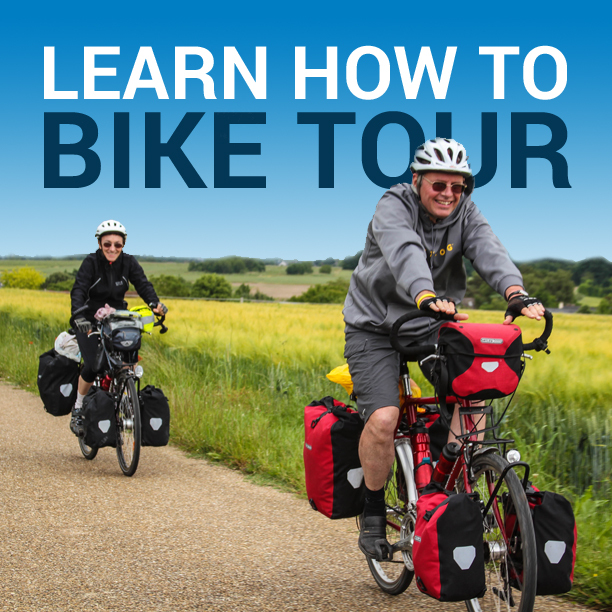 When it comes to long-distance bicycle touring, having a multitude of hand positions is vitally important to your comfort on the bike and your ability to continue cycling for extended lengths of time. When it comes to shifters, Co-Motion gives you the choice of equipping your bicycle with either bar-end shifters (which are easy to adjust and repair on the road and are preferred by many in the bicycle touring world) or to upgrade to STI integrated brake and gear shifters (which are more common in the world of bicycle racing). While many of my touring bicycles in the past have used STI integrated shifters, I opted for bar-end shifters on my new Co-Motion Pangea. One of the things that makes the Co-Motion Pangea so unique its use of disc brakes, rather than the old-fashioned rim brakes that are so prevalent in much of the touring world. By equipping your bicycle with modern disc brakes, you can stop your heavy, loaded bicycle in a much shorter amount of time, control your bicycle with greater ease, and increase your safety while out on the road. It is the wheels on the Pangea that make this bicycle really stand out against many of the other touring bicycles on the market. The Pangea, as its name suggests, is a bike that is made to go just about anywhere, and the wider 26 inch size wheels/tires on the bike allow you to use the bicycle for both on and off-road riding. Plus, 26 inch wheels and tires are a standard size just about everywhere in the world, which means that finding replacements parts will be a breeze during international travels. If you plan to travel with your bike a lot (like I do), you can even opt to have your Co-Motion bicycle equipped with S&S couplers, which are small metal fasteners that are welded to your bicycle’s frame that allows you to take the bicycle apart, fold it up, and fit it inside a case that is small enough to fly on many airplanes for free! Essentially, the S&S couplers allow you to enjoy the benefits of traveling with a folding bicycle, but with the joy and comfort of a full-size bike. I personally opted for the S&S couplers on my Pangea and I look forward to seeing how they perform. Finally, when you order a Co-Motion bicycle, you get your choice of thousands of custom paint jobs. When you buy a Co-Motion bike, you aren’t getting a mass-produced bicycle made by a company in China and re-branded by a western corporation. Instead, you are getting a totally customized, one-of-a-kind, touring bicycle made just for you, and you alone! Just look at all the paint color options that Co-Motion currently provides. It is for all these reasons (and because the bicycle is so beautiful and well made) that I decided to use the Co-Motion Pangea on my upcoming bicycle tour across Europe and Africa. Unfortunately, I don’t have my Pangea just yet. I’ve placed my order and I’m schedule to receive my new bike any day now. As soon as I finish cycling across Iceland, however, I should have a pretty good idea of what the Co-Motion Pangea is like as a touring bicycle and I’ll share more about the bike with you at that time. In the meantime, if you have any questions about the Co-Motion Pangea, why I chose this bicycle for my upcoming tour, or whether you think the Pangea might be the ideal touring bicycle for your own bicycle touring adventures, leave a question or comment below and I’ll get back to you just as soon as I can. This entry was posted in Bicycle Touring Pro Articles, Bicycles, Interviews, Main Articles, Products and tagged 26 inch touring bike, 26 touring bicycle, best touring bikes, bicycle touring africa, co-motion pangea, comotion bikes, comotion cycles, comotion pangea, comotion touring bicycle, global touring bike, mountain touring bicycle, off-road touring bike, touring africa, touring bicycles, touring bikes, touring by bicycle, world touring bicycle. Have a great trip. I have a Cannondale t2000 touring and opted also for the bar end shifters. I love them. Very reliable. What panniers do you use. I am looking for some new ones. any suggestions? Randy, I will be using Ortlieb Sport-Packer and Bike-Packer panniers on my upcoming bicycle tour. I’ve used several other different brands in the past, but these are my favorite for road touring. Lightweight and waterproof! Anyway, what did your config’d ride cost? Sweet, Darren! The Pangea is on my short list of “dream bikes” too, along with the Co-Motion Divide. I shared your article on my FB page. (https://www.facebook.com/TwoWheeledExplorer) Looking forward to hearing more! You’re gonna love this bike. I wish I could afford one. Not many “made in the USA” touring bikes out there other than high end custom built. Co-Motion rocks for having a couple of models to choose from. I’ll be curious to see how you spec yours, considering the wide range of conditions you plan on riding. Love the bike and the set-up for touring. Do you have any concerns about the disc brakes? I’m happy to see they are mech and not hyd, but I’d worry about the rotors somehow getting bent in the middle of no-where, comments? Yes, disc brakes on touring bicycles is a new thing. And traditionally you might not choose to get disc brakes on a touring bicycle because, like you mentioned, if they break while you in a remote corner of the world, fixing them or finding replacement parts can be extremely difficult and sometimes impossible. This will be my first touring bicycle with disc brakes, so I will let you know how it works out. I’ve had disc brakes on several of my other non-touring bicycles before and haven’t had a lot of problems with them, so it will be interesting to see how these perform. If worst comes to worse, you can remove the brakes entirely and use your feet to stop! ha ha. Just kidding. Your choice seems like a great bike, and my congratulations with the new bike. My question to you concerning your choice of wheel 26″. Even-though you shall go off road wouldn’t it have been better with 29″ and a tie 700x40c for the speed on roads? I am new in touring and will have my first trip this summer so have a lack of experience, therefor my question. Cheers and have a great trip here in Europa and in Africa. Yes, many cyclists will probably prefer larger 700c or 29 inch wheels. 700c wheels are standard on most touring bicycles for this reason. When it comes to bicycle touring, however, speed is usually not a top priority, as bicycle touring is a relatively slow endeavor. Strength, comfort and the ability to haul a lot of gear is typically more important on a touring bicycle. Personally, I don’t think that the minimal difference of speed on these two wheel sizes really makes any kind of a difference in this particular case – where I am touring at a low-speed almost 99% of the time. The other good thing about these smaller 26″ wheels is that they have a shorter diameter, and are therefore easier to travel with. I’m going to try and fly with my new Co-Motion on the airplane to Iceland, for example, and see if I can check it on the plane without having to pay the extra fee for flying with a full-size bicycle. If I can get away with it, that will be a HUGE benefit to owning this particular touring bicycle. To me, flying the bike for free will far exceed whatever benefits might be obtained from having slightly larger wheels. Your choice of 26″ wheels for ultimate world-wide compatibility seems to contradict the choice of disc brakes for ultimate world-wide incompatibility. I would think that not just the rotors would be a problem, but if you have wheel failure, wouldn’t you need a disc-compatible wheel, thus making the omnipresence of 26″ wheels completely irrelevant? Yes, you are kind of right. Disc brakes are not the best for compatibility around the world. The wheels and tires, however, are standard just about anywhere in the world. It is the hubs on the wheels, however, that are again, going to be difficult to find if anything should go wrong with them. However, the rims, spokes and tires found on 26″ bikes are usually the first things to break or wear out and are easy to find just about anywhere in the world. Finding a replacement hub that is compatible with disc brakes, however, is difficult and/or impossible in many parts of the world. Again, if you opt for disc brakes in a round-the-world bicycle touring scenerio, you just have to hope that nothing major does wrong with them or the wheel hubs when you are touring. Interesting read. Currently in Barcelona with no wheels, I have been reading your Bike Friday content thinking this might be the way to go for me next trip. So I’ll be interested in how the larger wheel experience turn out. I currently have (and adore) a Rodriguez Rainer as my commuter and touring bike (Rodriguez is another small Pacific NW builder). I skipped the S&S couplers during the build and have thought about a retrofit. Your experiences will guide my decision for my upcoming trip to Australia at the end of the year. Have a great trip and I’m looking forward to your updates! Thanks for your comment Matt. I’ll be sure to let you know how the new bike works out. I am so excited about getting it and, most importantly, riding it! Soon. Very soon!!! Fantastic choices. Looks like a great bike. You will have a great time. I am most interested in your review of the S&S couplers. I am very strongly considering the Co-motion Americano, but an hesitant about going for the couplers. How do you package the bike for air travel? Hii Darren, I am currently about to build my 1st true Touring bike. I shall be receiving my 2016 SOMA Juice this week. I must say the points you highlighted here on the Co-motion will help me in deciding on components. However, as I plan a lengthy tour in Africa, I have opted for a Rohloff Gear Hub. Congrats on the new bike. Let me know how it works out for you. Valued article, i firstly know this bicycle, our country india hero group is the leading manufacturer of bicycles, another group is Hercules and Atlas. They shipped their cycles over more than 40 countries.